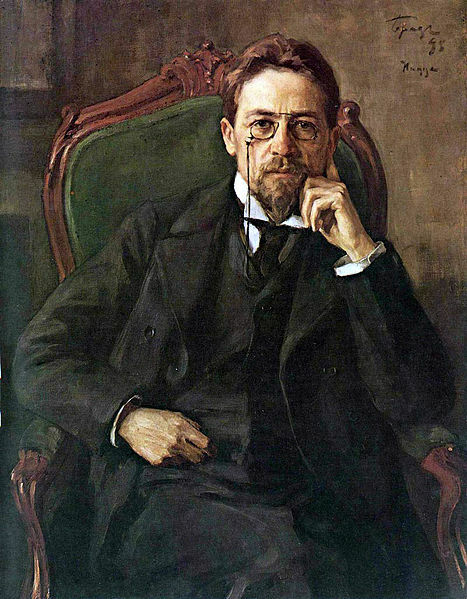 So apparently there’s this gentleman named Anton Chekhov, a Russian short story writer who was born in 1860. I feel ashamed to have only fairly recently come to hear this guy. I have not yet even done any in-depth research, but I will, and you can too if you like. There is, of course, an article about him over at Wikipedia, and also over at my favorite wiki-site, tvtropes.org ( http://tinyurl.com/py4jbbp ). Anyway I’m not going to give you his biography, that’s what those articles are for, except that (spoilers) he died in 1904. I first came to hear the name Chekhov in reference to something called “Chekhov’s Razor,” which would be a fun an interesting literary device that I attempted – with wild success. The principle is simple. After having written a novel, or at the very least, the first chapter or two, simply cut off the first three pages. That’s it. The idea, of course, is to get things moving. Does your story have a slow start? Throw out the first three pages. Are you unsatisfied with your opening? Try putting the first three pages to the torch. Generally if one does this, the story has begun – and that’s the point. You’ll save your readers a lot of annoying slow-paced setting. Chekhov’s Boomerang – when a “gun” unexpectedly returns. Chekhov’s News Report – when something is mentioned early on, say via newsprint or television, that plays an important role later in the story. Chekhov’s Hobby / Skill – when the “gun” is in fact something that a (the main?) character does or has, and turns out to be really useful in the end. Making story-writing history like a boss. This book was given to me as a gift, with the hope that in it I might discover a whiff of inspiration. Not only was I happy to find this to be true, I was pleasantly surprised by the quality of writing and the simple joy of simply enjoying the style – to say nothing of the content. We’ll get to that in a moment. Who this book is for: people with a dark sense of humor, fans of stories about criminals or estranged folks, anyone remotely interested in [post-Revolution] France, or anyone who thinks they’d enjoy a very different story. It’s a story about a murderer, but I wouldn’t call it a murder mystery nor a horror. There’re some (possibly) fantastical elements to it, but there’s no real indication that this is fantasy or paranormal. This book is about the power of scent, as one might deduce from the title, and a Parisian’s struggle from birth to go through life with an inhumanly acute sense of smell – and an excellent memory and hatred of humanity to go with it. In describing the protagonist/villain Grenouille (“grr-noo-ee”) to a friend of mine, I told of how he did not grasp the concept of spoken language until later childhood. Nouns such as milk made no sense to Grenouille, for milk had a distinct odor yes, but that odor was different depending on the cow, the food eaten by the cow, or even how spoiled the milk was throughout the day if left out. How could one word mean something as complicated as milk? Much like categorizing the book. The author describes the world as seen by Grenouille through his nose, and it is a miserable, stinking world to be sure, populated by pitiful, stinking people. While most of the novel describes Grenouille’s life story, and those folk unfortunate enough to have anything to do with him, it is anything but slow-paced. Several times as I was reading I almost began to think “okay, hurry it up,” but the story would turn or develop in such a satisfactory way before I would ever feel such impatience. In other words, the storytelling of Perfume is fun, the pacing was perfect for me, and the subject matter was fascinating. A refreshing, interesting bit of literature that I’ll be thinking about even as I try to get through A Storm Of Swords. Go read it, and forever rethink how you (and your characters) sniff the world around. So anyone who claims to be a writer or claims to have read many books (often those two go hand in hand, as it were), has likely heard of a number of conditions the likes of which famous names such as Emily Dickinson, Edgar Allan Poe, Ernest Hemingway have attributed to them. A quick Google search with things like “alcoholic authors” or “authors with mental illnesses list” will quickly result in many many blog posts, each of which are detailed bullets of famous folks who ended up with untimely deaths or sad lives (or both). Those lists are interesting and all but that’s not what I’m going to do here. All I’m doing is just observing this fact. Today I happened to listen to the podcast of Writing Excuses ( http://www.writingexcuses.com/2013/02/24/writing-excuses-8-8-writing-and-personal-health/ ), where the hosts and hostess talk about their very real mental illnesses. These people clearly have it together, and point of fact quite a few people with mental illnesses do (ironically), at least most of the time in such a way as to pass off as “normal” individuals to the rest of the world. Now, I had read and heard of the correlation between mental illnesses and writers in the past, but today my interest was reignited. After reading up on a few articles, several of which were merely different takes on the same Swedish study, the findings are interesting. It’s not just writers, of course, but creative people in general who tend to show signs of depression, substance abuse, schizophrenia and a host of all kinds of debilitating conditions. There are arguments about this, of course. Is there a genuine correlation, for instance, or it just that people with mental illnesses are generally attracted to creative professions or hobbies? Is it the stress of writing, painting or performing that drives people to states that they reach, or are they like that before they ever pick up a pen/brush/pair of ballet shoes? Well, I of course, don’t claim to know. But I do find it interesting. It’s not easy admitting to having a mental illness (oops), let alone the extent or nature of it, but the fact of the matter is that they are real conditions, too easily confused with “being too sensitive” or “just not able to lighten up” or whatever. So what’s the moral of this blog? I dunno. Go hug a writer or something. Also! If you want to check them out, there is also an excellent organization known as the Take This Project ( http://takethisproject.tumblr.com/post/36001643791/take-this-project-mission-statement ), a bunch of gamers and mental health professionals who take this seriously. I’m glad to know they’re around and that they’re helping folks. If you or someone you know has a mental illness, I’d sooner point to them. Today I shall share with you, dearest dukes and duchesses, what I believe are some over-used phrases that I see in writing. And by over-used, I mean I saw them often enough to actually make a list and blog about why they irritate me. Describing something as razor sharp. The most common I see is “Razor sharp teeth,” “razor sharp claws,” or a sword/knife that’s been hones to a razor’s edge. This is lazy description to me. Whenever I see this, I feel the writer doesn’t really know what they’re actually suggesting. Fangs are technically not sharp, they’re really pointy. And a shark’s tooth is sharp as hell, but also serrated to tear through things. Have you looked at one recently? Same with claws and talons. Claws are tough, but not sharp – they’re pointy, there’s a difference – and often claws serve a multi-function – climbing, digging, etc. A razor’s edge by definition is very thin, and by extension, frail. Something as useful as a claw or as brittle as a tooth (no big cat uses its long fangs to attack, only to kill subdued prey) would actually be rendered fragile were it to have an edge. The same thing applies to weaponry. Ever hold a razor? Ever try swinging it, let alone hitting something? Without the aid of fantastical elements, which is fine, claws-teeth-metal blades would dent, bend, break if they actually had an edge as thin as a razor. In any way, shape or form. Similar to above. Overused and usually not used properly. Thankfully it’s a modern phrase (and if you like to read, chances are you recognize how modern speech sorta spits on the rules of the language), and does not usually appear in fantasy writing. It defies description. Or worse: it can’t be described. Well, isn’t that your job? You’re a writer. Describe it. Otherwise, you as the storyteller or the character are/is being lazy. Maybe that’s part of the theme – a character (narrator or otherwise) who for plot reasons actually is incapable of describing something – being terrified, for instance – but don’t be all like “I’d love to tell you but words fail me.” Words didn’t fail you. You failed the words. How about you, dearest readers? Are there phrases that you see again and again that irritate you? Or do you disagree with what I have opined here? /end rant. Subsequent posts will be more positive, I promise.